Day 2 - Loving and being loved. We woke up at 6am to watch the sunrise Haitian skyline with a view overseeing the city. The city was more alive than we had thought it would be. Sydney and I lent a hand making pancakes for breakfast while Hannah helped make the eggs. After a filling breakfast, we layered on our sunscreen and bug spray to physically prepare for the Home for the Sick and Dying babies. Although physically prepared, nothing but prayer could help us prepare for our day. We stepped into rooms filled with young children who watched our every moves with curious eyes. Some would cry, trying to get our attention drawn towards them so they could spend a few wonderful minutes in someone’s arms feeling their love. 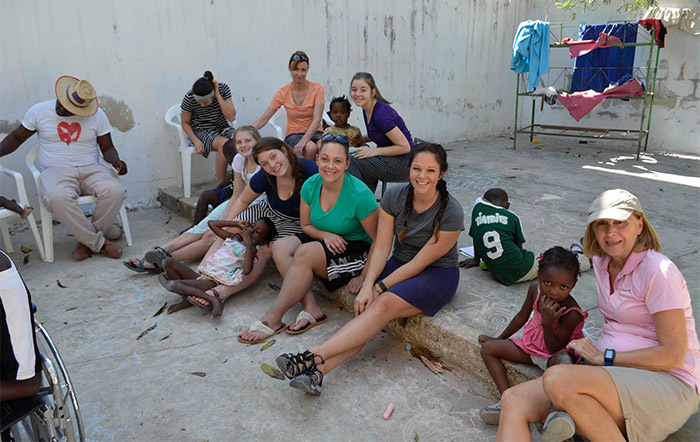 Our group had our hands full of children from start to finish, trying to love on every child. We walked outside with the kids in our arms or soothed them. As we set the kids down their cries would pierce our hearts. Many times, leaving the child we had previously been holding was too difficult to part with. We ended our time at the Home for the Sick and Dying Babies by helping feed numerous hungry mouths. While some kids ferociously devoured their food, others would be much more difficult to coax into eating. After a short stop at the guesthouse for snacks, we headed out to Dare's, an orphanage for handicapped children. Along with coloring supplies, jump ropes, and chalk, we arrived at the gates to be welcomed by kids crawling, running, and wheeling towards us with smiles on their faces. We were immediately drawn into piling multiple kids on a wheelchair for rides. Along with wheelchair rides we were able to worship with the children and adults alike by singing songs in a mix of English and Creole. The adults at Dare's joined us in prayer and we set out to leave. It was difficult to part with their joyous presence. Lastly, we headed to Apparent Project for a tour of their facility and some time to shop. We ordered our smoothies and got a behind the scenes tour to see how all the products were made. We saw various beads being made, the pottery studio, and the screen printing room. After being touched by the hardworking and talented parents, we got to shop for the handmade goods they spent so much time making. We had never made such a meaningful purchase, as we knew how much of an impact our shopping had on the lives of some families. Apparent Project was living proof that one person could make an incredible difference, since the founder of the organization was just a couple looking to adopt a child and ended up accomplishing so much more. Back at the guesthouse we reflected on our experiences by sharing one word that summed up our day. The experiences were difficult to sum into one word, but it was touching to see how much our love, and how much God’s love, made a difference in the lives of some Haitians. Not only were we giving love, but we were receiving it. The children embraced us with open minds and open hearts as they allowed us to pick them up and spread love to them as well. Seeing how wholeheartedly content all of these children were with their live despite not having an abundance of material things like many of us put into perspective where our true treasures lie. Today was a day of realizing what God provides and how much is accomplished through his love. Our entire group arrived at the airport before 3:15 am. We all knew this was a good sign. Even though we all have different paths of faith, are different ages, from different cities and attend different churches, we began our sense of community early. The team bonded over a need for coffee and bagels, and the lack of sleep we all got the night before. We laughed about a broken zipper on a checked bag that required embarrassing amounts of scotch packing tape. Everyone set an expectation for the trip and upon our arrival, we were asked to throw them out the door. The flights were uneventful, other than a pretty abrupt landing in Haiti and we made it to our guest house early. After sorting donations and cleaning up a few products that exploded in flight, we settled into our rooms and then went to meet the neighborhood boys. Everyone was so surprised how many of the boys and workers remembered those who were returning to Haiti. It was really touching to see firsthand how big of an impact others in our group have already made on this country. After introductions, we started a sweaty and dusty game of pick up soccer. It took a while to figure out who was on what team, but eventually we got the hang of it and even scored a few goals on the neighborhood boys. After soccer, we enjoyed a community-style dinner of shepard’s pie and some of the best Coca-Cola many of us had every had. All of our food scraps were put onto a plate for the guard dogs and the whole group pitched in to clean up the kitchen. We had heard the food here was great, and those rumors were right! We watched the sunset, learned the house rules and then gathered for an evening devotional. After setting all expectations aside, we shared unique facts about ourselves and picked a word of the day. The overall theme was everyone wanted to have an open mind and open heart to the people of Haiti, the people in our group and ways that God will work in our lives this week. We shared about vulnerability, comfort, love and leadership. Everyone is excited to be here and looking forward to a week guided by God’s love. From mostly strangers to a group ready to be guided by His plan, everyone is feeling unified and grateful for the unique reasons we are here. With love, thank you for reading about our first day and being a part of our journey.